Cases, cipramil (celexa) stories,, lundbeck, Our story., psychiatry, Random, Shanes story. The Pharmaceutical Industry’s Influence in Irish Politics and Medicine. The pharmaceutical industry has a long and tangled involvement within Irish politics. Besides politics, our medical ‘experts’ have built up their training and expertise while simultaneously having a fundamental collegial relationship with the pharmaceutical industry. Pharma politics may not be news to Americans, Latvians or our British neighbours – but as Ireland is my Country of birth, I claim poetic licence in focusing on my specific geographical area. Corruption within this industry has been widely publicised elsewhere but there seems to be a reticence within the Irish media to report on pharma wrongdoing or the objectivity of the psychiatric expert. My son, a young Irishman, died under the influence of 17 days of Citalopram (an SSRI antidepressant) – manufactured by Lundbeck, prescribed by a doctor, licensed by the Irish Medicine’s Board (henceforth IMB) and protected by the Irish College of Psychiatry (henceforth the College). Despite much evidence to the contrary, our health Minister James Reilly has been quoted in the media as saying that “SSRIs aren’t addictive and treat depression effectively”. He also denied that GPs are systematically over-prescribing SSRIs. He subsequently managed to ignore two medical experts (David Healy and Declan Gilsenan) who gave testimony in Leinster House that antidepressants were the leading cause of death within the mental health field and were in fact causing hundreds of Irish deaths each year. According to the Irish Pharmaceutical Healthcare Association there are approximately 120 pharmaceutical companies that have plants in Ireland – including 9 of the 10 largest pharmaceutical companies in the world. Last year the Irish Times reported that the Irish Government ‘came under pressure’ from the larger pharmaceutical firms over the Health Service Executives’ (HSE) decision not to approve new drugs for payment. There was an implied threat that this could ‘have implications for 25,000 jobs and future investment’ – so not surprisingly Enda Kenny and James Reilly backed down. The Times further reported that both had meetings with Abbott Laboratories and Eli Lilly, and further that Enda Kenny attended Eli Lilly’s board dinner at the Old Kinsale golf club in 2011. It is submitted that this relationship is much too close for comfort and therefore not conducive to having the Nation’s best interests at heart. Backing down under pressure from a bullying industry is never a good move, particularly when as a Nation we naturally assume that our Government is in control. The name ‘antidepressant’ itself is pure marketing genius by the pharmaceutical industry. Who would believe that these so-called magic pills can cause death, sometimes self-inflicted and extremely violent? In protecting the medical model, referring to antidepressant-induced suicide, the College stated “Anecdotal cases of suicide sometimes mistakenly attribute these tragic events to the treatment rather than the illness itself”. This is a vastly differing stance compared to the IMB, the European Medicine’s Agency (EMA) and the Food and Drug Administration (FDA). The American regulator FDA slapped a black-box warning on all antidepressants, informing consumers of the increased risk of suicide. The EMA followed suit requiring labelling changes to all antidepressants, again informing consumers of the increased risk of drug-induced suicidality. The IMB is pretty limited in its capacity of protector of Irish citizens, deferring largely to the EMA. Interestingly, the IMB is almost fully funded by the pharmaceutical industry, so the public protector is funded by the very industry that it is supposed to be protecting the Irish people from. It should be noted that peter gøtzsche of the Nordic Cochrane Centre in Copenhagen recently stated that the IMB banned GlaxoSmithKline from claiming that Paroxetine (Seroxat/Paxil) corrects a chemical imbalance. That depression is caused by a ‘chemical imbalance’ is a pharma invention used as a tool to sell antidepressant drugs. That the IMB made an executive decision and actually suppressed GSK or any other pharmaceutical company is the exception rather than the rule. Similar to the attempt at suppressing Sherif Sultan, the psychiatric Professors Patricia Casey, University College Dublin, and Ted Dinan, University College Cork, involved themselves not only in my son’s inquest but also with others where antidepressants were implicated. Both had long links to the same pharmaceutical companies who manufactured the implicated drug and both without exception defended the drugs, instead blaming the supposed underlying ‘illnesses’. Both these professors are supposed experts in the psychiatric field and both fiercely defend antidepressants. It is submitted that the objectivity of the expert opinion is paramount, particularly where the law is concerned. As the coronial system is the only Court of law where a deceased’s family can get answers, in cases of drug-induced death, bias or even a perception of bias should automatically render these ‘experts’ excluded from the legal process. The health of the Irish nation will never be of utmost importance while our medical professionals, the IMB and the Irish Government have a vested interest in upholding the existing ‘pharma funded’ regime. While it seems my son was just a number in the collateral damage of the latter – I urge you to protect your family, start asking questions and stop trusting these dubious so-called professionals. I often wondered how involved the Irish Government is with the cesspit that is the pharmaceutical industry. I have never been able to understand why the Irish Government have failed to protect its citizens from the dangers of dubious drugs; drugs that are not illegal but prescribed to innocent people and licensed by the Irish Medicines Board. This week it was reported that the Irish Government came under pressure from the larger pharmaceutical firms over the HSE’s decision not to approve new drugs for payment. There was an implied threat that this could ‘have implications for 25,000 jobs and future investment’. So naturally, like good little boys, our Taoiseach Enda Kenny and his sidekick James Reilly backed down. The Irish Times reported that Minister Reilly and Enda Kenny met with representatives of ‘Abbott Laboratories’ in July. 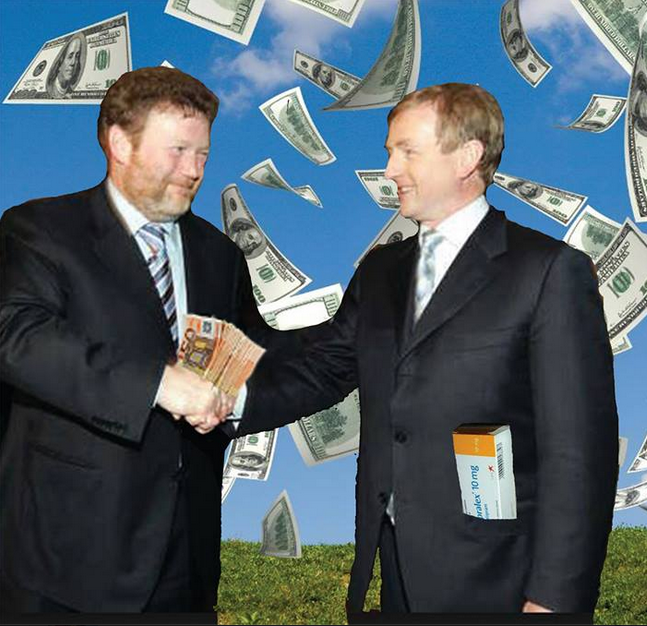 The Times further reported that James Reilly met with Andrew Hotchkiss (European boss of Eli Lilly) in June and that Enda Kenny attended the Eli Lilly board dinner at the Old Kinsale golf club on June 2011. Bit too close for comfort? This year Abbott Laboratories were fined $1.6 billion for off-label marketing of Depakote (an anti-seizure drug). They actively promoted this dangerous drug for dementia sufferers in nursing homes; nice company! Can dementia sufferers answer back? Ah yes, then there is Eli Lilly; one of the bigger pharma companies, and one with the dubious accolade of being fined over a billion dollars for the illegal off-label marketing of the antipsychotic drug Zyprexa. In previously hidden data which Eli Lilly did not want to become public knowledge, Zyprexa had the highest suicide rate in clinical trial history. If that wasn’t bad enough, the drug was known to cause diabetes in some people. Eli Lilly are also the creators of Prozac, you know the one; mother’s little helper. Prozac has caused numerous deaths (including Maria’s son, Toran Henry) and was found, last Nov, by a Canadian Judge, to be the cause of a teenager (with no history of violence) killing his friend. Lilly’s Cymbalta was the drug that Traci Johnson (a 19 year old student) was on when she died by suicide in an Eli Lilly lab. She had no history of depression and was a ‘healthy’ volunteer. 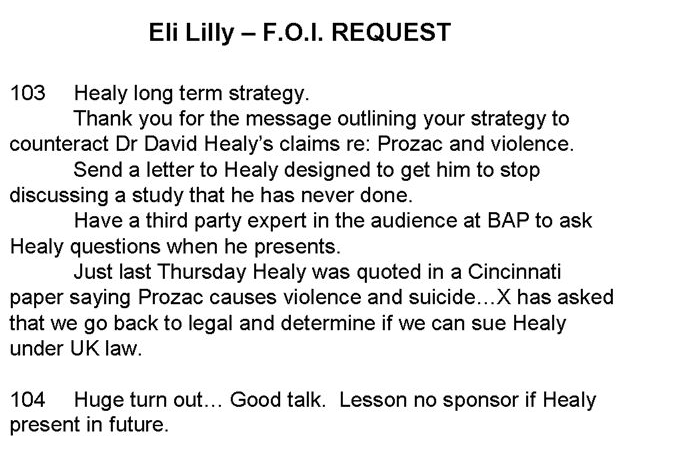 Unsurprisingly perhaps, Eli Lilly are not fans of Professor David Healy, who was instrumental in getting the ‘hidden’ data released. In the internal e-mail on the left, Lilly execs stated, among other things, that conferences will not receive sponsorship if ‘Healy’ was present. You couldn’t make it up, could you? Then there is John Virapen who I mentioned in my last post. He worked for Eli Lilly for over 30 years and describes how he bribed a Swedish Government official to ‘help’ with the licencing of Prozac. You can download a free copy of his book here. It makes for very interesting reading. Looks like the pharmaceutical industry is calling the shots in Ireland. 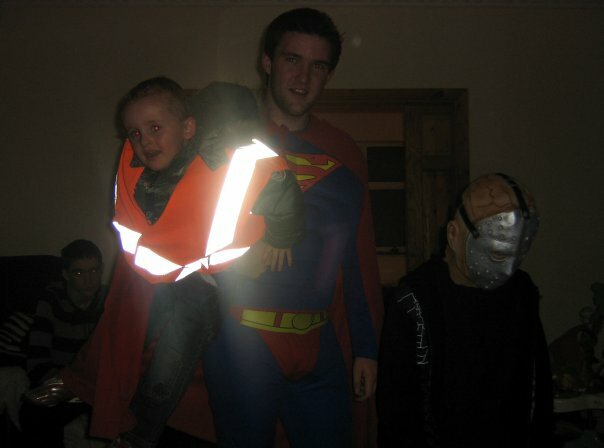 Collateral damage wasn’t mentioned at the dinner, was it Enda? It will be interesting to see how many of the 2o lobbying pharmaceutical companies these two representatives of the Irish public, met up with. No such thing as a free lunch? Well for the Irish people whose health is on the table, it seems not, but it seems to be a different story for our own ‘Sir Stan and Hardy’. Does that sound very irreverent? I have zero respect for a Government, who are aware that prescribed drugs are killing people, and are burying their heads in the sand due to kowtowing to the billion dollar pharmaceutical industry. 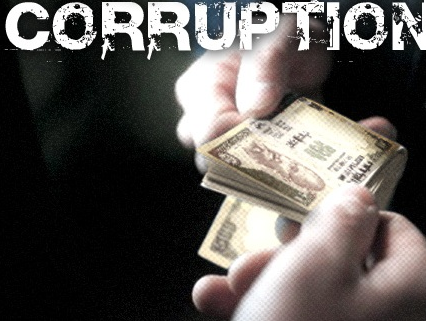 Is it an excuse to say that all Governments do it? I think not. My son was Irish, he was born in Ireland, he loved Ireland and yet he was badly let down by these ‘penpushers’ we call Ministers. Conflict of interest between the medical profession and big pharma…Patients pay for pharma perks. Late last year, about 40 doctors attended an overnight conference at the luxury Sheen Falls Lodge in Co Kerry. It also offers salmon and trout fishing on the River Sheen, clay pigeon shooting, floodlit tennis and a health and fitness centre with gymnasium, jacuzzi, sauna, plunge pool and steam room. A night at Sheen Falls does not come cheap. Even in low season, the most basic room costs €260. But the doctors did not have to worry about the cost. Lundbeck, a pharmaceutical company that makes psychiatric and neurologial drugs,was picking up the tab. The lavishness of Lundbeck’s hospitality is not unusual. Pharmaceutical companies regularly invite doctors to attend functions at fine hotels and golf courses. A glance through the social pages of the medical trade press in recent months confirms the picture.The pages of the Irish Medical News, Medicine Weekly and Pharm Views are littered with photos of doctors mingling with executives from the leading drugs companies at social, educational and charitable events ranging from golf classics to conferences to gala dinners. In recent months, sponsors of such events included Abbott Laboratories, Organon Laboratories, Astra Zeneca, Eli Lilly, Bristol Myers Squibb, GlaxoSmithKline and Lundbeck. With state expenditure on medicines having doubled over the last five years to €629 million, and the private medicines bill similarly soaring, even the medical profession is beginning to ask if their relationship with Big Pharma has become too cosy. The British Medical Journal last month devoted an entire issue to probe the relationship between doctors and pharmaceutical companies. In a strongly-worded editorial headed “No more free lunches”, the BMJ concluded that doctors and drug companies are “entwined in an embrace of avarice and excess, an embrace that distorts medical information and patient care”. The BMJ found evidence that drug companies influence doctors’ prescribing habits, either through discussions with sales representatives or through sales drives dressed up as medical education. It quoted a British research group that found that doctors who have frequent contact with drug representatives are more willing to prescribe new drugs, do not like ending consultations with advice only, and are more likely to agree to prescribe a drug that is not clinically indicated. And things aren’t much different here, according to Dr Richard Brennan, chairman of the Irish College of General Practitioners.